In the past few days, Part I and Part II of this series have quickly become two of the most popular articles on the site. 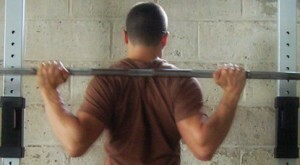 In this, the final article of the series, I outline 3 more little-known tips to improve your squat. Ready to bust through your plateaus and squat more than everyone in your gym? We’ve all heard dogma of the sort. The quads are vilified as the evil, good-for-nothing muscle group that’s only useful for promoting anterior chain dominance and poor movement quality. The hamstrings, however, are touted as the king muscle group – high priest of the lower body – and most neglected complex throughout all populations. The hamstrings are extremely important; there’s no denying it. A bi-articulate complex (crossing both the hip and knee joints), strong hamstrings prevent injury, improve posture, and increase performance. Sounds pretty damn good to me. So what’s the dip? Strong quads are important, too! Too often we’re told that quads are useless and overemphasized in daily living. Consequently we’re often advised to quit training the quads and solely focus on building the posterior chain (glutes & hamstrings). Considering research has shown back squats can produce 2.7 times MORE quadriceps than hamstring activity, it goes without saying the quads play a major role in squat performance. Plain and simple, if you want to squat big weights, don’t neglect your quads. You don’t need to use isolation exercises like leg extensions. Rather, knee-dominant movements such as variations of lunges, step-ups, split squats, and prowler pushes are all fantastic drills that will help build a pair of truly spectacular quads. The thoracic (t-spine) region refers to the upper portion of the back. Seemingly unrelated to the shoulder, thoracic mobility drastically influences shoulder health and function. In essence, a lack of thoracic mobility leads to a subsequent decrease in shoulder mobility which often leads to shoulder pain and injury. What the hell does this have to do with squat performance? To squat effectively you need to get your hands behind the bar and squeeze your upper back to generate total body tension. Whether you realize it or not, this requires a great deal of shoulder mobility. Without sufficient shoulder external rotation (as pictured above) you’ll be incapable of getting your hands behind the bar to maintain ideal position for a safe, effective, and pain-free squat. So what’s a squatter to do? Achieve and maintain adequate t-spine mobility. Doing so will lead to overall improvements in shoulder health and function, subsequently leading to enhanced long-term squat performance. How do you improve t-spine mobility? 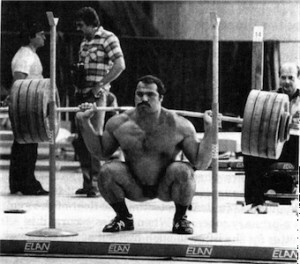 Common powerlifting dogma advocates sitting as far back onto the heels as possible throughout the entire squat. In forcing all of your bodyweight onto the heels you tend to decrease foot-to-floor contact which negatively impacts balance. Furthermore, solely driving through the heels makes it impossible to fully utilize the intrinsic muscles of the foot which stabilize the feet and provide the entire base of support for your squat. In the short 2-minute video below I outline my preferred strategy for foot-to-floor contact during the squat. As outlined in the video, I prefer to center my weight and grip the floor between the natural tri-pod of the foot. Doing so provides a more stable base of support which facilitates a safer and stronger squat. If you did, I highly encourage to take a look at my Elite Performance Squat Seminar. Want to download your copy? Click the link below for instant access! 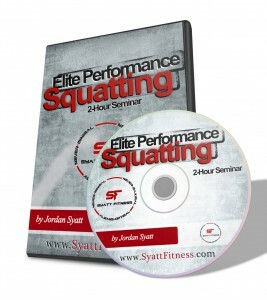 I Want The Elite Performance Squat Seminar! I hope you enjoyed this article and, as always, if you have any questions, comments, or suggestions leave them below.